The immaculate tea gift for the tea lover who travels! Our Tuffy Tea Steeper is a durable, reusable, steeping basket that folds for easy storage, travel, and tea on-the-go. The large-volume strainer allows ample room for tea leaves to unfurl - a critical element of great infusers. 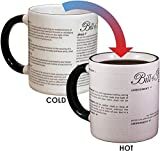 The adjustable height makes it compatible with most mugs. The lid keeps tea hot while it steeps and doubles as a saucer for the basket when the tea has brewed, for a dripless clean steep. We've paired our bright red Tuffy Steeper with our best-selling loose leaf green tea, Boulder Blues. This loose leaf blend of sencha and dragonwell create a smooth green tea base for wild strawberry and rhubarb flavors to add a subtle sweetness. The broad deep green leaves yield a light green liquor with a delicious aroma and lively flavor. Sugar-free. Gluten-free. The excellent stocking stuffer! 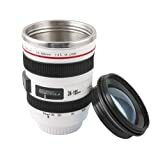 Features: 99.9% similar copy of the Original Canon EF 24-105mm f/4L IS USM Lens Comes with a screw lid hood This product is cup/mug and NOT the actual lens. 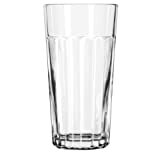 Product is made of food grade PVC plastic material and safe to use for drinking. (e.g. coffee, tea, milk, water, fruit juice, ice-cream, and etc.) It's approximate liquid volume 375ml. The product can also be used a pen holder. It can be an amazing gift for a camera or novelty fans and photography enthusiasts. 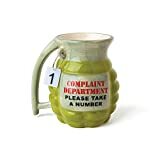 This fun "Take a number" mug makes a great gag gift for any coffee or tea lover! It's also a fun mug to treat yourself with, with the grenade shape, pull ring and number tab. This fun mug holds 16 ounces of your popular beverage and is made of superior ceramic. The most popular casual dinnerware collection in America, Butterfly Meadow is truly a contemporary mix and match classic. Inspired by the artistry of Louise Le Luyer, there are many delightful pattern varriations to choose from, each offering an exquisite array of butterflies, blooms and other wonders of nature, all rendered in a soft color palette. Crafted of the finest Lenox porcelain, Butterfly Meadow is the adept choice for today. All of the dinnerware is safe for use in the dishwasher, the microwave and guarantees superior freezer to oven to table performance. Designed for chip-resistant durability, Butterfly Meadow will take a cherished place in your home for many years and offers the opportunity to expand your collection with the incredible range of dining, decor and gift giving choices available. Best of all, this versatile, dapper and fun collection is created by Lenox, America's first name in home entertaining. Known around the world for offering a unique combination of design, artistry and superior quality for over 125 years, Lenox has unmatched durability and is backed up by a lifetime replacement program to guarantee many years of enjoyment. One of six different designs, the giftboxed Blue Butterfly cup and saucer set helps make your meal perfect from first bite to last sip. 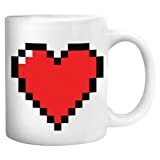 Everyone knows that when your heart is almost empty, you better refill it quick just fill the mug with your esteemed hot elixir and watch as the pixel heart rejuvenates before your eyes. 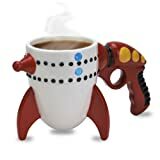 Then you'll be ready to face whatever challenges await, whether it's a tough boss, rescuing kidnapped royalty or saving the planet mug measures 3-1/4 by 5 by 3-3/4-inch. Hand wash only. Do not microwave.